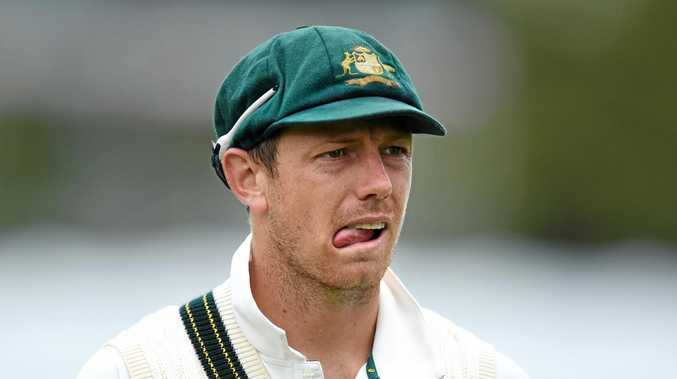 CRICKET Australia has confirmed electric fast bowler James Pattinson will miss the entire Ashes series, in a devastating blow that now makes quick Nathan Coulter-Nile a genuine chance for a Test debut this summer. Pattinson's chronic stress fracture problem now appears as though it could be potentially career threatening, with the young star to now take an indefinite break from bowling. CA say they're confident Pattinson can fight his body and get back onto the field, but as reported in The Daily Telegraph, there are grave concerns within the Australian camp that a main stress fracture in his back could remain a weakness for him for as long as he plays the game. The 27-year-old game breaker was originally slated to return for the tour of Bangladesh, before his comeback was pushed back to the start of the summer. But another recent aggravation has left Pattinson devastated and Australia's four-pronged fast bowling cartel down to three. "... We have been monitoring him, including regular scans and recent imaging has confirmed that James has begun to reaggravate his previous lower back stress fracture," said CA's head physio, Alex Kountouris. "As such, he has discontinued bowling as part of his recovery which unfortunately means that he will be unavailable for the beginning of the Sheffield Shield and subsequently Ashes campaign. "However, James' current injury is complex because his history of old stress fractures from his teenage years means there is one part of his spin that absorbs more force than it would normally do. "This is the area of the current reaggravation but we are hopeful that we can put strategies in place to help manage this when James returns to playing." A shattered Pattinson said he would refuse to give up. "Obviously I am extremely disappointed with this setback after just getting back into a good run of playing cricket," he said. "I'm especially disappointed to miss out on the possibility to play in a home Ashes series. "Over the next few weeks I will discuss all options available to me with medical staff, to work out the best plan to prevent this from happening again." The latest problems flared up after the June Champions Trophy in England and his subsequent stint in UK county cricket. Pattinson's misfortunate could be Western Australia quick Nathan Coulter-Nile's gain - with the rapid right-armer impressing on the one-day tour of India. Coulter-Nile himself is injury prone and hasn't played a first-class match since February 2016. However, former Test great Michael Slater believes he's primed for a role as back-up to Pat Cummins, Mitchell Starc and Josh Hazlewood. Coulter-Nile is set to play the second and third Shield matches of the season for Western Australia.